Pursuing Justice and Documenting the Truth: The Story of Hirut Abebe. Never Again: A powerful promise or empty rhetoric? 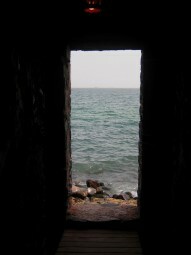 The AUHRM project aims to post a wide range of articles that depict the true nature of Africa's past genocidal history. We would like to encourage our readers to send us stories, commentaries, personal experiences that are relevant to our mission. 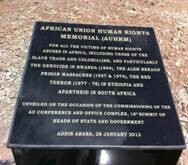 AUHRM will be a dynamic site and will evolve in partnership with a network of groups and associations dedicated to the remembrance of atrocities in Africa. The project is still at an early stage and welcomes ideas and comments from potential partners interested in informing the development of the site and extending its reach across the continent. Please contact us at: JLIB_HTML_CLOAKING . Click here to view Partner organizations. 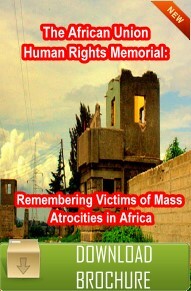 "The Memorial places especial emphasis upon those innocent victims of abuses executed or sponsored by African states and leaders such as the Rwandan genocide, the slaughter in cold blood of the senior officials of Emperor Haile Sellassie’s government and the tens of thousands of youth wantonly slain during the Red Terror – two of the many grave crimes against human rights committed here by the military regime. Though there are no doubt the dirty hands of others in these infamous deeds in Ethiopia and Rwanda, what is being singled out for particular attention are serious crimes for which, above all, we ourselves are to blame. This is one reason why it is important that African states and governments collectively resolved to honor the memory of those lost, innocent African lives. What is being recognized at this site today is a deep moral fact about ourselves that no emergent generation of Africans can ever afford to forget." 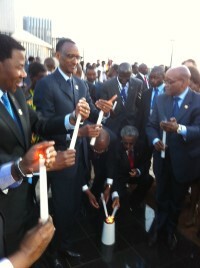 Copyright © 2013 The African Union Human Rights Memorial. All Rights Reserved.